This article was originally published at ComicBook.Com on October 29, 2014. What more needs to be said about Brian K. Vaughan and Fiona Staples’ Saga? Besides The Walking Dead, it is consistently the best selling creator owned comic in the American marketplace. It has made regular appearances at the biggest award ceremonies in comics since its debut and walked away with plenty of statues. Its fan base is as excited as ever, creating incredible costumes and continuing to buy up the collections as they share them with friends and family. Saga is great. A more obvious statement does not exist in comics. Saga #24 marks a change though, as it moves away from the pattern established in earlier arcs of the series. 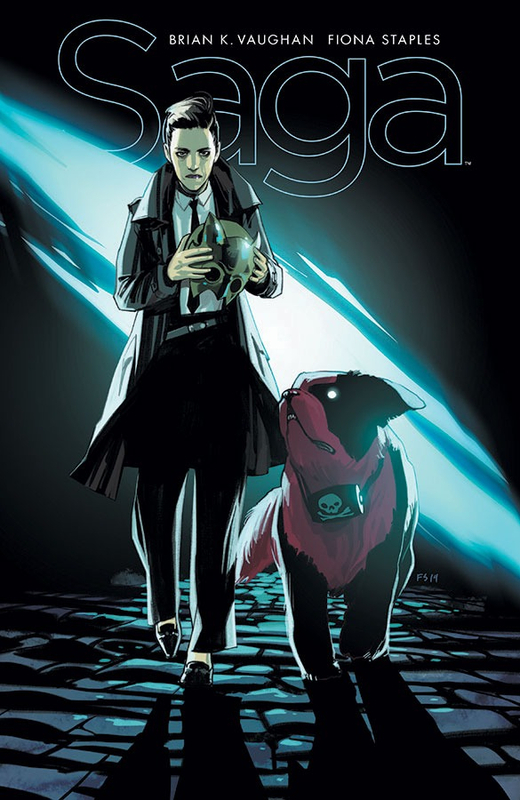 The central storyline of the current six-issue run was already concluded inSaga #23, so this issue acts as a coda. It does not relate directly to the events of the previous five issues, but expands its scope to the many characters absent from them. What could have easily become an issue of filler or a plot dump is woven into a cohesive short story that consistently surprises, shocks, and delights. There are three distinct splash pages in Saga #24 that perfectly summarize what works so well not only in this brief tale, but the series as a whole. Staples’ opening pages have developed a reputation for being impactful. The range of reactions evoked by the 24 splash pages she has created so far range from befuddlement to shock, from horror to delight. This issue’s page is most certainly of the delightful variety. It’s the sort of image that instantly forms a smile on your face and will cause you to hesitate before turning the page. The image is so effective because it is so well composed. Staples places the reader above the centered subject of the page, making it seem considerably smaller by comparison. It’s diminutive size and open posture make it the most friendly of figures. The appearance of the character is delightful as well. Staples has a knack for anthropomorphism and can easily focus on the features that are most effectual throughout the animal kingdom. The second splash page occurs at the midpoint of the comic and reveals Vaughan’s ability to quickly invest a story with drama. It builds upon a sequence that shifts from being funny to exciting to horrifying in a handful of panels. The entire sequence is a masterful showcase of rising drama and reversals in momentum. When the final reversal is revealed in a beautifully illustrated page, it brings with it a wave of emotion. In the grand scheme of Saga, this brief encounter is a very small moment, but Vaughan and Staples instill it with as much meaning and feeling as some of the series biggest. Then there’s the final page. Nobody in monthly comics crafts cliffhangers like Vaughan and this is one that will stick with readers until Saga #25 hits the shelves. To mention any detail about it would be to ruin the fun of turning the page. Staples composes the panel in such a way that plenty of information is available through posture and design in order to create a potent mystery. She sprinkles plenty of minor details throughout it as well to excite readers. It’s a perfect cliffhanger, one that leaves you starving for just one more panel. Saga #24 changes the rhythm of the series and alters the landscape of the story, all while providing the same incredible standard of storytelling fans have come to expect. It’s a reminder as to why this series is so well loved just in time for its next hiatus. The wait will be long, but Staples and Vaughan have proven time and again that the new issues are worth the long months away. It’s a perfect time to enjoy the newest issue, and then start again from the beginning. Comic pages simply don’t get better than this.